Dix petits morceaux d’orgue que Will Long (désormais seul à la tête de Celer) a enregistré pour une exposition de peintures de Taichi Kondo (peut-être que le disque passait toute la journée en mode repeat ?). Dix petits morceaux accrochés les uns aux autres qui donnent un grand tout (mais un grand tout de 24 minutes seulement) qui m’a, je dois bien le reconnaître, soufflé. No one freezes memories and life experiences into musical amber quite like Will Long. 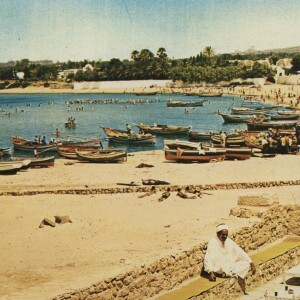 His recordings under the name Celer always have a context and back-story that is essential to full appreciation of the work and never more so than on his forthcoming album Two days and one night in which he retraces and re-imagines the journey a great uncle who drowned in 1984 off the coast of Tunisia while staying at the Hotel Amilcar. Using the same template that worked so well on the beautiful Sky Limits (2014), Long creates an immersive stream of consciousness experience by juxtaposing field recordings in the form of short vignettes that create a sense of place with mellifluous billowing drones of wistful beauty. Street sounds, a TV broadcast, or gentle breakers washing over the beach serve as points of reference as we float on a sea of melancholic contemplation in such tracks as ‘Spindles and fire’, ‘Sol Azur’, and the incredibly immersive centerpiece, ‘In all deracinated things’. By the time ‘Terminal Points’ fades into silence, we have traveled far and been deeply moved, so much so that it is hard not to submit to the illusion that these memories have become our own. In 1984, my great uncle drowned in the sea off the coast of Hammamet, Tunisia. He was 80 years old. He arrived in Tunis from his home in New York City, staying one night in the Hotel Amilcar, from where he sent a blank postcard back to his family home in Mississippi. The next day he traveled to Hammamet, where he rented a hotel room, bought swimming trunks, and by the afternoon had drowned in the ocean. In 2015, I retraced his steps from Tunis to Hammamet. Set part in fiction and part in reality, Two Days and One Night is both a document of my own experience and a re-imagining of what my great uncle might have heard and experienced 31 years before. It’s a shame he didn’t see the burnt orange sunset swirling over the horizon as I did on my departing flight at the end of the second day, but then again, maybe he did. were made for an exhibition of paintings by Taichi Kondo, whose work I don’t know (and I am not sure if Google shows the right ones; the cover has one of his paintings of course, but that doesn’t justify a fully informed opinion). Will Long, also known as Celer, was quite inspired by the paintings and recorded a whole bunch of ideas, but in the end only used the one that used an organ recording of twenty minutes and recorded a bunch of variations of that, using a variety of settings and spaces. In each piece there is one movement, rising and decaying, and sometimes this is repeated within the space of one piece, but each block is separated by (near) silence, which is of course a clever thing; it makes it easier for the listener to choose random/shuffle play and keep that on repeat for a long time, so new configurations keep appearing for the listener, which makes all of this wonderful. The music is very soft and not outspoken but as such ranks among the best ambient music around these days. Maybe a few more variations and thus a bit longer release would have been even better, but I had a great time, much longer than the ‘real’ length of this release, listening to this on shuffle and repeat and doing not much else in terms of other things than listening.